Love the escape of Amish fiction? Seek Me With All Your Heart is the first part in the series covering the painful migration to new pastures. A brand new romantic novel from 'Woman of the Year 2010' Beth Wiseman. In this emotional and epic novel it highlights the struggles and difficulties of a community that is torn between burying painful memories and uncovering new ones. What pain would cause the Amish people to move to Colorado, leaving behind what they once loved? Embarking on a journey for cheap land, fleeing harmful memories and running away from painful experiences, but for Emily Detweiler and her family the move is much more personal. Faith has been stripped from Emily, leaving her vulnerable and weak, with a move away being essential for her health. Moving to Canaan is the only possible answer. Another family making the move to Canaan, includes David Stoltzfus, where he is hit hard by a health condition that can take his life at any point. Wanting to move back home, his life collides with Emily's and with his future uncertain his heart is not. They begin to fall in love but with Emily's painful past and David's undefined future the relationship becomes harder than they could ever imagine. Seek Me With All Your Heart by Beth Wiseman was published by Thomas Nelson in September 2010 and is our 1027th best seller. The ISBN for Seek Me With All Your Heart is 9781595548245. 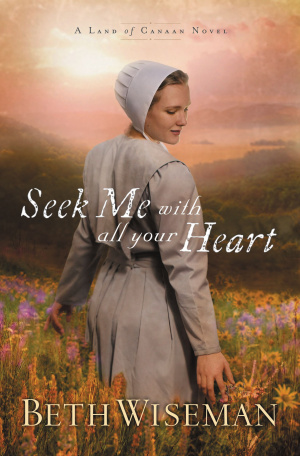 Be the first to review Seek Me With All Your Heart! Got a question? No problem! Just click here to ask us about Seek Me With All Your Heart.